Estate Living With the BEST Wide Water Views & Sunsets in South Florida!This fabulous 4400 SF estate home is located on more than a one-quarter acre lot on the Intracoastal Waterway offering you the absolute best water views and sunsets on the Intracoastal. 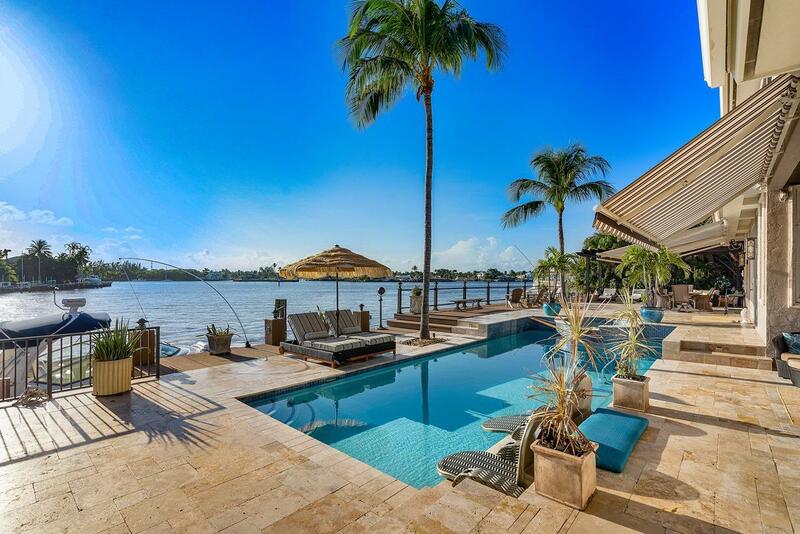 If a waterfront lifestyle is your dream, this is your next home. This 4 bedroom,5.5 bath home has been totally renovated. From the new open floor plan with cathedral and vaulted ceilings, new baseboard and crown molding, to the beautiful wood and marble flooring and custom staircase to the electrical and plumbing throughout the home have all been renovated and upgraded. There's also new interior and exterior paint. It's almost like moving into a new home.The spacious living room has a new bar, new stone fireplace, and you'll enjoy spectacular views of the custom pool and Intracoastal Waterway through the floor to ceiling doors and windows. The room flows seamlessly into the formal dining area with its equally fabulous waterfront views. The renovated gourmet kitchen offers a large center island prep area with sink and enough counter space to accommodate casual dining and entertaining. Other wonderful features include expansive granite countertops, new custom cabinetry with fabulous storage space, a hooded cooktop, all new top of the line stainless steel appliances and a pantry. The kitchen opens directly into the family room is with access to the covered patio with gorgeous water views. For business or pleasure, there's a large theater room with a wood lined tongue in groove coffered ceiling, a beautiful custom bookcase with large built-in TV and new sound system. There are two Master suites, one located upstairs and one on the main level. The upper suite has a large covered balcony, custom bathroom, wet bar and a laundry area for convenience. The ground floor master suite features a beautiful stone fireplace and the adjoining master bath offers dual sinks, a bidet, separate shower, spa tub & shower, and fabulous countertop and custom storage space. The brand new custom designed walk-in closet provides incredible space for him and her with everything from varied height clothes hanging racks, to shelf and drawer space, a belt rack and shoe storage racks. Exterior features include both covered patio with motorized awnings, and an open area with grill allowing plenty of room for outdoor entertaining. The beautiful new heated pool with spillover spa is just steps away from the 105' of water frontage and dock. The fence and railing along the dock are new and the dock provides both a boat lift and a new kayak lift. You're located you just minutes from ocean access via the Boynton Beach Inlet and for beach lovers, you're just a short distance to the private beach and clubhouse available only to homeowners in this subdivision. Beside living in one of the safest and most desirable communities in south Florida and being close to great dining and shopping this estate home offer other great amenities. These include hurricane impact doors and windows throughout, and the following brand new items recently installed and upgraded: garage doors, sprinkler system, air conditioning unit, interior intercom and full home security system.